It's pretty rare for clients to contact me a year in advance asking for a ketubah, enough that they stand out in my memory. It's my business to create & deliver my ketubot fast, but I definitely appreciate a slower turnaround! In this case, it gave us time to bring to life Justin & Keri's vision of an enchanted forest full of color and symbolism. 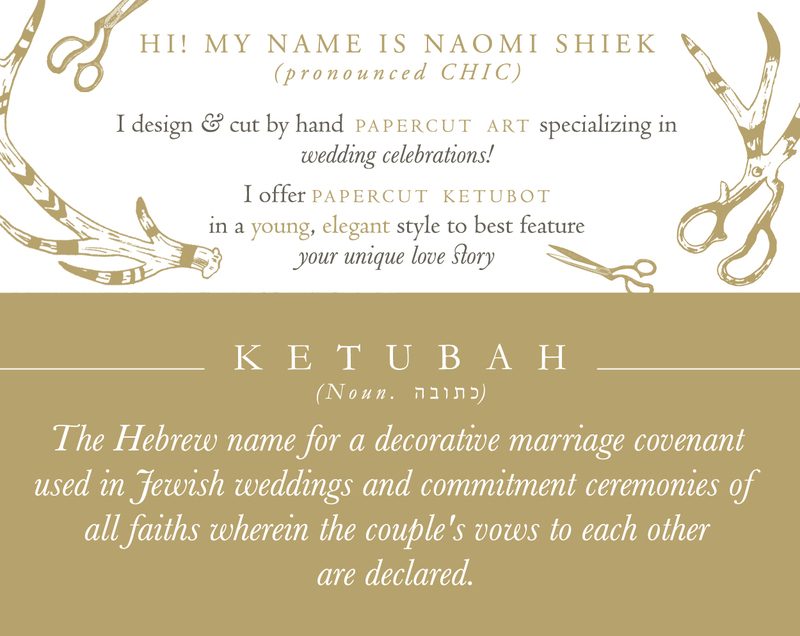 Keri & Justin first contacted me in the summer of 2016 looking for a specific and unique large-scale ketubah for their autumn wedding the following year. They sent me a booklet detailing their vision with reference photos and descriptions of everything they wanted. While they were clear on their concept they were respectful of me as an artist and encouraged me to let my creativity go where it will with the design - the best clients a girl can ask for! They really wanted a multi-layered design with depth (specifically, they loved the look of a "tree tunnel"), like a shadowbox papercut. Due to how I need to pack my ketubot for safe shipping I can't frame them to create the shadowbox effect (unfortunately, wouldn't that be awesome!) but I was able to create the depth layering different color papers instead. There are four (4) tree layers here! We first started with the idea of a vertical layout, but quickly moved on to a landscape design so the trees would feel more "embracing". I actually really like the first draft (seen below) and wish someone would take a liking to it and commission it soon (with minor changes of course, like no giraffes) because how can you say no to all that leafy detail work? Back to the design: Once they realized they preferred the look and feel of the landscape orientation, it was up to me to fit all the elements and more. As you can imagine it's a big ask for a designer to harmoniously include everything the client wishes in way that's interesting and aesthetically pleasing. Sometimes edits have to be made, and creative interpretations made. 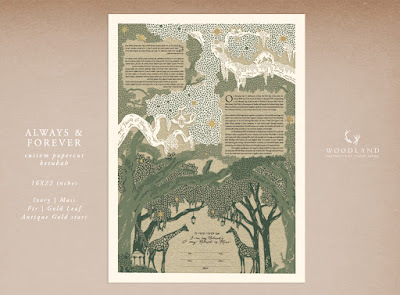 Textured tree canopy over the text, fairy lanterns, giraffes (symbolic animals to the couple), the gazebo where he proposed... to say nothing of the things I myself wanted to include, like deer (no forest scene is complete without one!) and thirteen stars for good fortune. In fact, I included 7 lanterns, 13 stars, and 16 coupled animals, equal to 36, which means Two Lives in Judaism (oh, and one fawn for prosperity). What's more I had to make sure all the layers were interacting correctly, that there wasn't any unplanned overlap to cover elements and lessen the effect of depth of field. It took a little more tinkering than my usual layered designs, but looking at the final ketubah every hour spent drawing and redrawing the layers was well worth it. 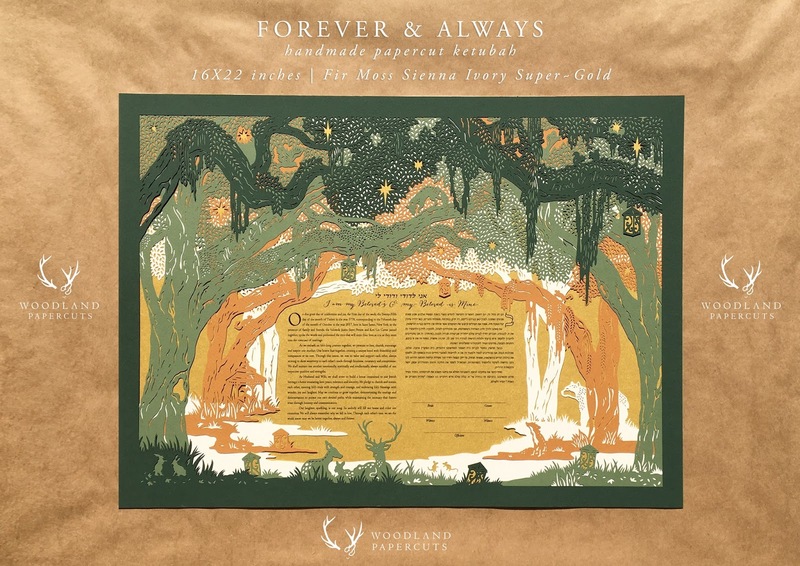 I believe the most important element (besides the custom text Keri & Justin provided) and the stepping stone for the entire fairytale concept was their motto ALWAYS & FOREVER, FOREVER & ALWAYS - which is also how the design got its name. We decided on cleverly working it into the tree bark, making it an inseparable, living, breathing part of the forest. Isn't it fitting? A fairytale's enchanted forest comes to life for an enchanted love story! 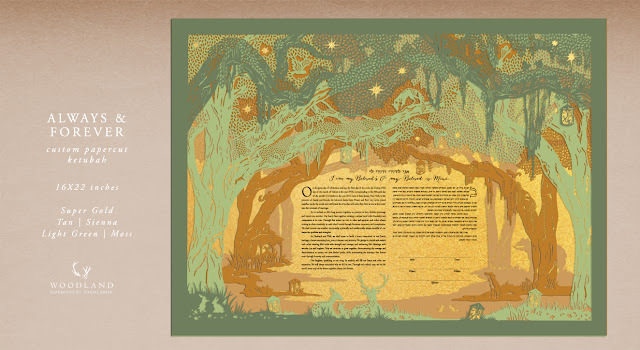 We received our ketubah and it's even more beautiful in person then we imagined. 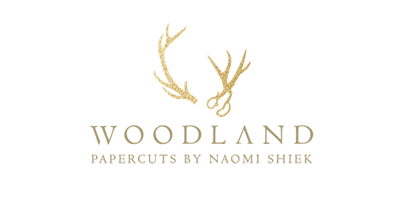 We just wanted to thank you again for all your handwork, creativity, and flexibility throughout the design process. It was a true pleasure working with you, you really made the whole experience from conception to completion truly enjoyable. Your work speaks for itself as to how talented you are. We are so thrilled to have a one-of-a kind piece of art that will fill the walls of our home for years to come.